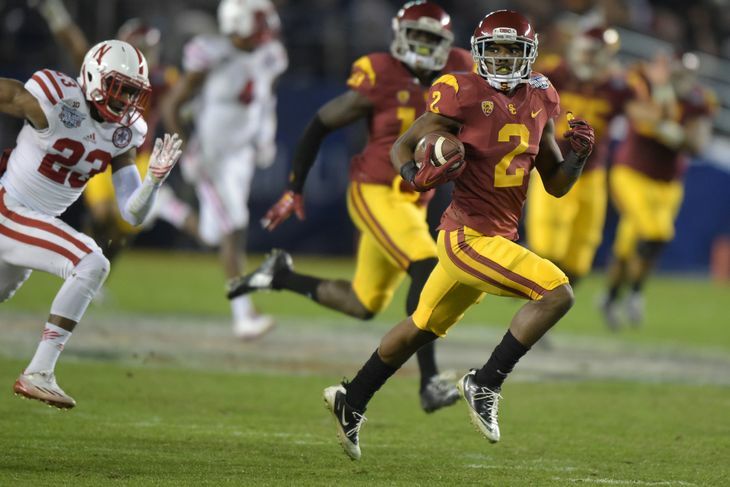 With a 45-42 victory over Nebraska, USC help Steve Sarkisian, the head coach of the Trojans for his first season, break his eight-win curse, helped by a big day from Adoree’ Jackson and running back Javorius Allen. Playing in San Diego meant it was pretty much a home game for the Trojans, despite the usual impressive turnout of Nebraska fans regardless of where their games are being played. Mike Riley was up in the booth, watching the team he’s going to take over next season. He saw the Cornhuskers start well but at some point struggle with running the ball while USC’s offense ran very smoothly until the fourth quarter, when Nebraska’s defense almost won them the game. Eventually, a hail mary by Tommy Armstrong Jr. fell well short of the mark as the ball was bounced out of bounds with time expiring. Armstrong scored a touchdown with some impressive jukes in the fourth quarter to put Nebraska within a field goal from USC, but his offense was shut down when it mattered. Armstrong threw three touchdown passes and ran for another, but his team’s disappointing running game (only 144 yards on 43 carries) meant too difficult of a road for them to go through. Cody Kessler threw three touchdown passes (and was intercepted once) but the real starts in this game were Allen, running for 152 yards and two touchdowns, and Jackson, the freshman cornerback who is probably going to see a lot more playing time as a receiver next season. Jackson returned a kickoff 98 yards on his team’s first touch of the ball to put them 7-3 in the lead and later made most of the 71 yards on his own, including escaping five surrounding defensive players to score an incredible touchdown, opening the third quarter. Both teams finish the season at 9-4. This has been the norm for Nebraska for quite some time in recent years, costing Bo Pellini his job, although the players did everything in their power to make everyone remember that they still support him. In the very difficult Pac-12, this kind of season failed to leave a mark for USC, but it does show they just might be in good hands under Sarkisian, providing a strong and promising finish to the season.